A tote is a common name for an Intermediate Bulk Container (IBC) used to store various chemicals. They have grown in popularity due to their improved space efficiency compared to drums and their re-usability through cleaning and recycling. Totes often contain flammable liquids and as such are subject to stringent regulations regarding storage and handling. Flammable liquids are defined by the National Fire Protection Association (NFPA) in their standard NFPA 30 as Class I liquids, with a Flash-point below 100 degrees Fahrenheit. Flash-point is a measure of the minimum temperature at which enough vapor is given off from the liquid to ignite. Boiling Point is a measure of the temperature at which the liquid changes into a gaseous state. These characteristics of flammable liquids highlight the risks associated with their handling and storage and the care which should be taken to prevent fires and explosions. 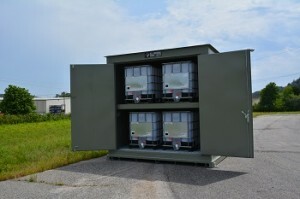 The US Chemicals Tote Lockers fall into the category of hazardous chemicals lockers and are therefore covered by NFPA 30. The design of the lockers with their specific fire protection elements enable them to be conveniently placed close to (or even inside an occupied building). Hazardous chemical lockers are constructed of fire resistant material, have automated fire protection and alarms and are designed to prevent spills from spreading. Chemicals can be categorized in groups according to compatibility. It is important to segregate totes of incompatible materials from one another in storage lockers. This is due to the fact that certain chemicals when mixed together can create a worse hazard than each one on its own. Different classes of flammable liquids can be separated from each other, or bases and acids can be separated from each other. There are different methods for categorizing chemical substances and the appropriate method must be selected for the specific application, while ensuring compliance with regulatory requirements. Contact US Chemical Storage to learn more about tote storage lockers or to receive a complimentary quote. Our professional consultants can advise you on the best solution for your application as well as the regulatory requirements that are relevant to your industry.